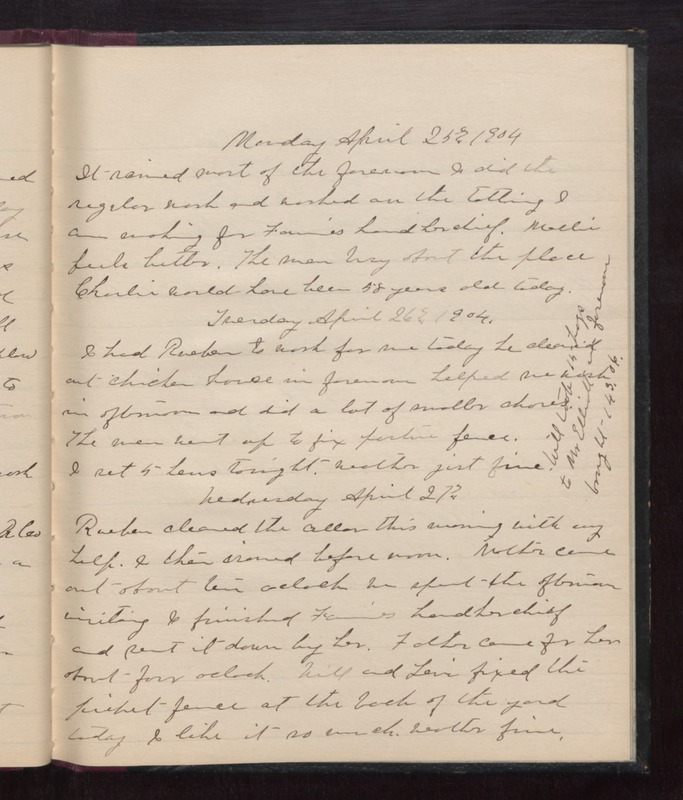 Monday April 25th 1904 It rained most of the forenoon. I did the regular work and worked on the tatting I am making for Fannies handkerchief. Mollie feels better. The men busy about the place. Charlie would have been 58 years old today. Tuesday April 26th 1904 I had Rueben to work for me today. He cleaned put the chicken house in forenoon, helped me wash in afternoon, and did a lot of smaller chores. The men went up to fix pasture fences. I set 5 hens tonight. weather just fine. Will took 14 hogs to Mr Elliotts in forenoon, brought $143.06. Wednesday April 27th 1904 Rueben cleaned the cellar this morning with my help. I then ironed before noon. Mother came out about ten oclock. We spent the afternoon visiting. I finished Fannies handkerchief and sent it down by her. Father came for her about four oclock. Will and Levi fixed the picket fence at the back of the yard today. I like it so much. weather fine.